1. The contest begins on 21-Dec-2007, 0:00 UTC and ends on 25-Mar-2008, 0:00 UTC (3 months of time. Christmas and Easter holidays inclusive). Submissions after that date cannot be taken into the voting process. Bugfixes and enhancements are welcome, but will not raise your score. 2. 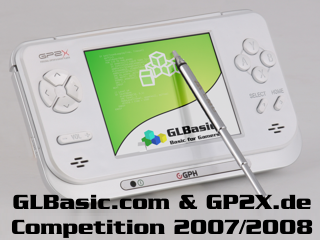 All submissions must be written exclusively for the "GLBasic/GP2X Contest 2007/2008". They must be new games, written from scratch. Continuing old projects leads to disqualification when noticed. 3. All submissions must be freeware and stay so. If you send something in, you agree to have your game published publically for good. 4. The game must be controllable with the cursor keys and the 10 buttons of the GP2X. However, it must feature touchscreen input as well to show how the pen can improve playabillity. 5. All games must run on the GP2X. That means, the resolution must be 320x240 pixels and you must not use the 3D commands. 6. The game has to feature a spash screen when it starts up that can be skipped with any button or additionally by tapping the screen. The splashscreen can be downloaded here: Click You must not alter nor fade the splash screen in or out. 7. All games must be created with GLBasic. The DEMO version totally suffices for this purpose. There is no need to purchase or upgrade in order to participate. 8. The source code can be sent in, allowing users of the DEMO version to have their game created with a full version. The source code will be published only at your explicit command. 10. The submission is done in .zip or .rar file format to this email address: gp2xcompo *at* glbasic *point* com. The file size is limited to 15 MB. In the main directory there must be a .gpe file (the game itself) or a .gbap and .gbas files (project and source code), to build the game. If you want the source code to stay in the release package, create a file "_keep_source.txt" in the main directory. 11. The scoring of the judges is final and incontestable. You're responsible for stay in the rules. The GP2X touchscreen gets polled with the MOUSESTATE command. Just make your game use the mouse + left mouse button only. Use the SYSTEMPOINTER TRUE command to show your mouse pointer. The GP2X buttons are explained in the reference manual for the KEY( ) command. GLBasic has no 30 day trial or similar. Only the runtime of the created programs is limited.